If you're not familiar with some of these terms, I'd highly recommend reading his post. In addition to the above approaches, C# 7 added pattern matching, which can be used in a similar way as the "Dictionary of types." Benchmarking is really hard (especially microbenchmarking), you can easily make a mistake during performance measurements. 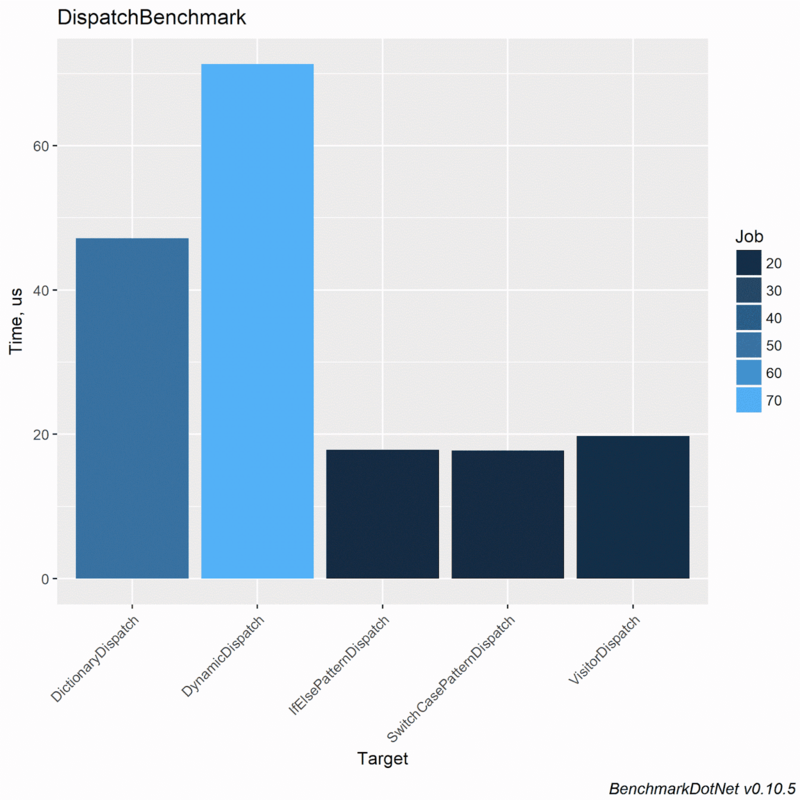 BenchmarkDotNet will protect you from the common pitfalls (even for experienced developers) because it does all the dirty work for you: it generates an isolated project per each benchmark method, does several launches of this project, run multiple iterations of the method (include warm-up), and so on. In the spirit of eating dessert first, here are the results of the benchmark. After the results, I'll walk through the benchmark code, or you can grab the full solution on github. My interpretation of these results is that all of these approaches are in the same order of magnitude. The dynamic approach is 4 times slower than pattern matching with if/else or switch/case, but I don't think that will be a bottleneck in most applications. It should be fine to use dynamic in places that aren't high-throughput, critical paths. Additionally, while these numbers can serve as a general guide, if you're finding the need to performance-tune your own system, you should benchmark that system and not rely on microbenchmarks like this. After we have our input, it's as simple as writing a method for each implementation, and adding the [Benchmark] attribute. We make sure to return the calculated values from each benchmark, so we don't have issues with dead-code elimination optimizing away our benchmark! And that's it! You can find more information about BenchmarkDotNet on their website.